Interactive Media using the web, video and animation for video and music productions, marketing promotion and training. TechnoVisual has highly skilled programmers and graphic artists who can help you or your company design a bespoke website and any online or computer based application. TechnoVisual has worked with a range of clients and the projects we have been involved with vary from small bespoke web sites and design contracts to large mass produced publications. Many of the developments and web sites we are asked to provide are done as part of a project involving the duplication, printing and selling of CDs or DVDs. Our programmers and graphic designers can provide the content for such developments, be it video for a theatrical or music based production or a training or demonstration presentation. Businesses have started to realise that sending out CDs or DVDs to interested clients can be a very powerful promotional tool and it does not need to be a costly operation. TechnoVisual has helped many small to medium size businesses put together a presentation of their product line or a demonstration of how the service they offer could be of great benefit to their clients. Our staff will be there to offer advice and expertise throughout the project and can also help with the final selling and distribution of your product, we are able to make the production work for you by providing it in a number of formats so that it could be shown as a feature on your web site or even on public video sites such as U tube. We can also provide your project in the form of CDs or DVDs which can be packaged up with your artwork and sent out with mailshots to interested parties or sold online. We can host your online project and offer advise on the best way to promote your business and portray your products in their best light, ensuring optimum coverage and ultimate market success. All for a very competitive price. As well as bespoke websites, TechnoVisual have been tasked to design and produce enhancements to existing sites, such as flash animations, menuing systems, special effects and 3d, video, photography and DVD authoring, all to give a site that edge which will make it stand out from those of its competitors. TechnoVisual are able to provide and manage simple commercial shop sites for selling your products. We are set up to carry out fulfilment of orders and for those sites selling CDs or DVDs we can deal with the process all the way through, from manufacture of the CD or DVD to delivery and are always happy to offer advice on marketing and sales techniques. TechnoVisual specialises in presentation packaging and folders. We have supplied promotional and presentation packages for many companies from initial concept and design, through the prototype stage and on to final production. Please call us for details 01280 815161. TechnoVisual are one of the few companys you will find, which are able to offer high quality short runs and limited editions of a huge range of promotional and bespoke printed materials, as well as long runs of the same items. We have helped many start up businesses with their branding, stationery and promotional material such as business cards, adverts brochures and flyers. We can also supply one-off prints or short runs of high quality prints such as A2, A3 and A4 photo prints, posters, folders, menus and CD and DVD inserts and booklets. TechnoVisual can also provide product photography, video and graphic design which may be required for this type of printing material. As we have the ability to provide such bespoke designs and printed material our service is ideal for things like wedding and event printing, we can help with the full range from inviites, menus and order of service, to place cards, printed favour boxes and even beautiful high quality packaging for photos and video on printed discs. Some of the themed or branded sets of printed material we have supplied have been simply gorgeous. Many local artists and photographers have used our services for scanning in their creations so they can be adjusted and cropped if need be and then set up with as close match as possible to the original ready for a run of prints, notelets or greetings cards. We will test the many printers and card types we have here to get the look and feel you were hoping for. Longer runs of litho printed materials such as flyers, leaflets, business cards and greatings cards are supplied by TechnoVisual using a trade printing partner. We offer very competitive prices, a choice of turnaround and free UK delivery for these products. The staff at TechnoVisual will also discuss which type of media would best be suited for each job, depending on the type of materials required and the budget available. As well as the standard high quality paper and card used for things like flyers, business cards, leaflets and packaging, we have various speciality types of card and paper in stock such as textured, marbled, matt/glossy duo etc which is perfect for products such as weddings, certificates and greetings cards. TechnoVisual also has the capability to provide matt or gloss film to various products and even custom shapes and sizes. At present we are in the process of design a Wedding and Special Event website to show off all our styles of wedding stationary and choice of designs. Should you require to see example designs or perhaps would like to see a sample in the meantime, please let us know. Please see the design and printing pages for pricing and further details or just call us on 01280 815161 for a quote. TechnoVisual can help you with all your Event stationery and unlike many companys we are happy to deal with very low volumes if required. From place cards, invites and Order of Service to packaging for your Event DVD, we can help with every aspect of your special event stationery. TechnoVisual are happy to fit in with your plans, we will take on the design, development and printing of the whole range of stationery required or we can deal with just the bits you need help with, let us know what you need and we will work with you to make it happen. TechnoVisual has a large range of smooth and textured cards in either white or ivory and a range of decoration such as ribbon, jewels, tassles and even gold, silver and coloured foil print to make your stationery really special. As well as standard designs we also own ornate dies for things like place cards, invites, favor boxes and envelopes. TechoVisual are happy to take ideas and artwork you may already have for the design of your event printing or we can work with you to find a design which works for you. We have a set of approximately 15 very unique and elegant designs ready to go for Wedding and other Special Event Stationery, please let us know if you would like to view this range. TechnoVisual can offer an array of CD and DVD duplication or replication options and should you also require printing onto the surface of the disc and packaging for your CD or DVD project, TechnoVisual are here to advise from start to finish. Whatever the project and whatever the quantity, we will tailor our processes to fit in specifically with your requirements. TechnoVisual are able to offer the completed production, from mastering the CD or authoring a DVD to the finished packaged product, ready for distribution. We can also provide the finished publication in a form suitable to incorporate into an existing web site or even as a YouTube or MySpace presentation. Please ask about information and advise on distribution of your finished package. Our clients range from unsigned bands and solo artists, schools and theatre groups and many varying businesses who have produced a publication for distribution as a CD or DVD. Such projects include training or demonstrational presentations, software, games and videos and therapies such as meditation and hypnotherapy. Many companies have recognised the power of directed marketing using a CD,DVD, Blu-ray disc, USB or downloadable digital file. Perhaps you would like to see your product-line set out into a structured presentation with a simple to use ‘menu’ system so that your clients can browse through at their leisure, in the comfort of their own home. As long as your client base has access to a computer or CD or DVD player, then you're in business! It may be that a demonstration of the service you offer in the form of a short video or animation, perhaps showing a 'Before and After' type scenario, is the ideal way forward. Our skilled staff will talk through the options with you and suggest the best processes to use. All our processes are carried out in-house, from video production and editing, animation, product photography with turn-table and green screen ability, graphic design, audio master and DVD authoring. You will be surprised at how little it can cost to undertake a project such as this. As a general rule we charge no more than £40.00 per hour plus vat for any service provided. TechnoVisual specialise mainly in shorter-runs in house, i.e. duplication and/or printing of up to approx 1000 items. However, we are also able to provide very competitive quotations for larger runs using our trade partners in Poland and Germany, over this quanitity, and in this case, pricing is dependent on the volume required. For much higher volume runs the 'Replication' process is normally used, which involves making up a glass master of the disc for copying and different print methods are also used for printing and packaging. TechnoVisual steps in to fulfill this 'short-run' niche requirement, we are happy to do as few units as required and as there are no real economies of scale, we charge the same for 10 discs as we would for 300. It may be that you have already sorted out the content and require that we simply duplicate this data onto a set number of discs. Alternatively, we are happy to print onto the face of a blank disc for you to add the content yourself and our company charge from 50p a disc for this. TechnoVisual can offer most types of packaging for both short and long run projects. We will guide you through the process and make sure you have everything you need if you would like to do the artwork for the package yourself. If you prefer we do the artwork for you this is no problem just let us know the ideas you have in mind and any text and images you would like us to use. We can offer a range of either high quality premium media and print finishes, or if your budget dictates we can offer a more standard media and print finish. As well as our large range of standard and bespoke packaging we also offer printed promotional items such as inserts, booklets and posters. Please visit Disc Duplication and Printing Page and our Disc Packaging Page for more information and a detailed price guide. TechnoVisual has an experienced video production and editing team which can provide video up to HD quality. The team can be hired at a price of £50.00 plus vat per hour or £320.00 plus vat per day, including the cameras and equiptment required. Post production, i.e. editing, titling, special effects and deployment in the format required is charged at a rate of £40.00 plus vat per hour. Our video and sound team are happy to travel to your location to offer on-site footage, alternatively, a suitable studio setting can be set up at the Chandos House, School Lane premises for smaller jobs such as head to camera, photography, voice-over recording or chroma-key screen work. It is always preferred that we sit down with a client for a planned meeting initially to work out exactly what is expected of the final video prior to offering a costing. TechnoVisual has a large range of video and audio equipment such as; a number of HD capable cameras (HDV plus full HD), backdrops plus chroma-key screens, various recording equipment, a jib/camera hoist, dolley and tracking system and various lighting. We are also very proud to be able to own an on site, fully equipt video and photography studio, this greatly enhances the overall service we can offer, it is set up with green screen, lighting and sound recording equipment plus teleprompter. Many local businesses have used it particularly for on-line videos and demos. Once edited with the addition of special effects, 3d animation and photography you will find the end result of our videos to be very rewarding. As well as videos and photography, the studio is set up for voice recording and a well produced professional audio track is a must for any video. We have also supplied many companies, artists and therapists with voice recording for their CD productions. We can then help in the mastering, duplication and packaging for these projects. TechnoVisual has supplied a number of very professional, gorgeous looking sets of product photos. With the right background, lighting and camera lenses any product can be made to look like it belongs on the cover of a very expensive glossy magazine, you will be amazed at the results, all for a very sensible price. Our photographer can also be hired at a rate of £40.00 per hour, plus vat to provide a set of professionally taken pictures. Our in house print facility allows us to supply these pictures as high quality prints on photographic/proofing paper or as posters up to A2 size. Please see prices on the Short Run Printing page. TechnoVisual are first and foremost a marketing and promotion company, we have years of experience and the huge advantage of being able to supply all the services this entails under one roof. Please see the Marketing and Promo Page to give you the full description on how we can help and support you with all your marketing or promotional requirements. 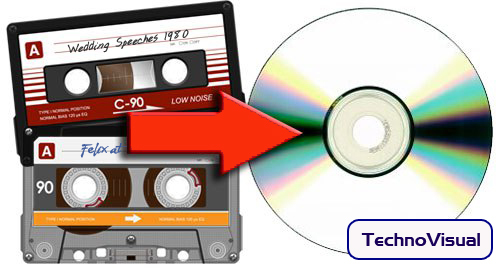 Please visit our Transfer VHS to DVD OR TAPE to CD pages for all the options we can offer and prices for each service. Remember all the music you used to listen to on your old music tapes? We can transfer this music/data for you onto CD for listening to and safe-keeping. Visit the link on our website for prices and further information.